It’s nice hearing the different views on how others are celebrating the Christmas season, don’t you agree? 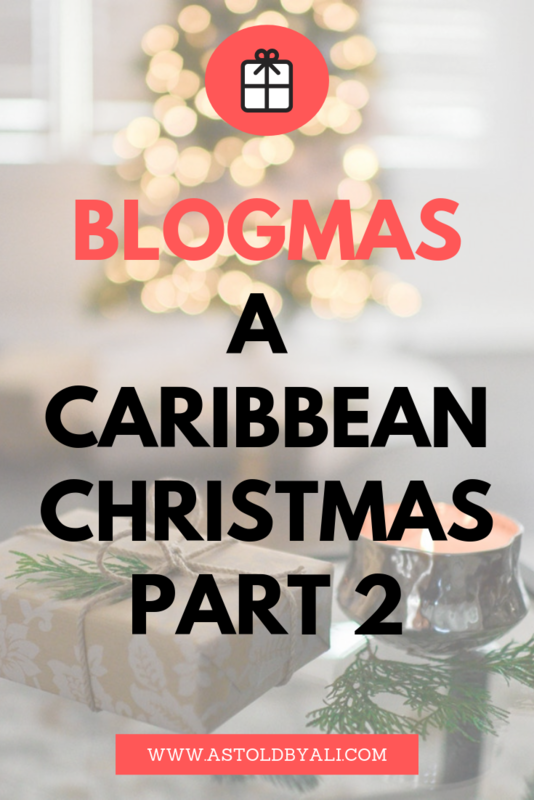 We started off hearing from two of my blogging buddies in Grenada and Guyana (here); now we’re going to hear from three more within the Caribbean region. 1 // What does Christmas mean to you? Christmas to me, isn’t necessarily a religious thing – it’s a season of giving, celebrating all the experiences I had during the year & celebrating that with friends & family by showing appreciating through gifts, good food & good vibes. 2 // How do you celebrate in your country? Christmas in Jamaica is usually celebrated with a church service across the different denominations of churches in Jamaica. In addition to that, it’s celebrated with a nice *feast* of some of the native dishes, such as curried goat, rice & peas, and lots of other food! On Christmas Eve, Jamaicans in various towns have something we call “Grand Market” which is where lots of vendors come out onto the streets and sell various things at really affordable prices, mostly toys & clothing. Christmas to me means the celebration of the birth of Jesus Christ, I mean that’s what I’ve been told in Sunday school ever since I’ve been a little girl and it’s something I still believe. I’m a church girl at heart. Other than that, Christmas means togetherness and unity. It’s a time where my family gets together and celebrate each other; it’s the one time of the year where we all get together, those who are near and far all come together for this one day. FOOD, who can forget food lol Christmas is all about eating. Overall Christmas means love, joy and happiness to me. Church plays a big role in our Christmas celebration, there are Christmas plays both in the schools and church, food is also a major part of the celebration. There’s certain food that you only eat around Christmas time. Just like Turkey is the star of Thanksgiving in the U.S., ham is the star of our Christmas in Antigua and Sorrel drink is the popular drink of the season. Celebrating with friends and family is how we ultimately celebrate Christmas. Cheau-deaux! Eggnog! Fruit Cakes! Fruit Cakes! Did I say Fruit Cakes! lol Christmas to me means a time of joy, love and life. If we celebrated life like we do Christmas Seasons, oh what a world this would be. On my Goddess of an Island Dominica, each community celebrates differently but other than Fruit Cake, lol you’ll hear a lot of bamboo bursting. We can’t forget our seasonal treats! Sorrel! Sweetened with natural cane syrup, steeped with cloves, cinnamon and ginger! Hmmhmmmm! Other than the food my island experiences joy on a complete level. The kids are out, smiles are out, hearts are world more on each other sleeves. Christmas on Dominica is God-given. Are you enjoying this series? Just one more edition to go!